The way in which every exhibition develops always differs. The two main ways in which most exhibitions come to pass are either that they develop from an idea you have had or, in the case of exhibitions that seem particularly original and exceptional, they come to you from a sister venue. Edvard Munch is the latter example. The exhibition began at the Centre Pompidou in Paris, where it was researched over many years, so my job has been to tweak it for Tate Modern. This includes adapting or adding some works and ideas where needed to make the exhibition work in a different space from the one it was originally designed for (thinking about how an exhibition unfolds in space is always crucial, and much careful thought goes into this). Part of my work over the last year and a half has involved several trips to the city where Munch spent the majority of his life – Oslo. 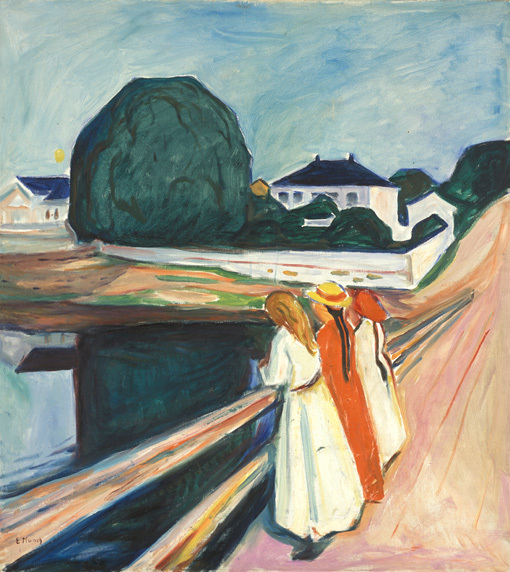 This is of course also where the Munch Museum is, which has the majority of his work and who are the main lenders to this exhibition. Because their support and collaboration has been so vital for us to realize this exhibition in London, I have worked closely with them in selecting works and discussing a myriad of other logistical details. In addition to seeing a huge number of Munch’s works, I’ve also been fortunate to see the houses and studios he works in, which has given me an invaluable glimpse into his life. For example, many of his most famous paintings, such Girls on the Bridge, are based on vistas that still survive today. It’s quite bizarre looking at a view already so familiar from a painting and realizing how little it has changed in the hundred or so years since it was depicted.